We’re celebrating back-to-school with great giveaways yesterday and today! Stay tuned and good luck! This next giveaway is for younger kids as they get ready for back-to-school! 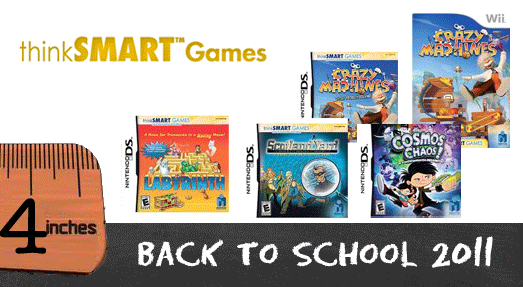 thinkSmart Games are fun and educational games for Nintendo Wii and DS handheld systems designed to keep children excited and engaged while they play! Think outside of the box and push the boundaries of creative thinking as you utilize random objects (anvil, rolling spheres and more!) to build a variety of increasingly complex contraptions that cause chain reactions. Big picture thinking, big fun and big points await in the construction of Crazy Machines! When it comes to fun and educational games, nothing can compare to Cosmos Chaos! Funded by a Star Schools grant from the U.S. Department of Education and developed by PREL (Pacific Resources for Education and Learning), Cosmos Chaos! is a collaborative effort on the part of talented video game developers and respected experts in the field of educational research. The result? An exciting and challenging reading game that’s as fun as it is educational! Based on the popular board game, Labyrinth drops players in a series of mazes where logical thinking and problem-solving skills are the only way out. Move the walls with the stylus and discover all your treasures in the labyrinth before your opponents do! The chase is a-foot! Scotland Yard is searching for Mister X in London, New York, Berlin, Paris & Amsterdam. Deductive thinking and procedural logic are key as players aid the famous detectives in the capture of the elusive Mr. X. My girls don’t have DS systems, so we weren’t able to play those games, but we did spend some time playing Crazy Machines together. Because they’re so young — and the games includes a lot of written instructions — it was a game that we had to play together, but I loved the logic involved in figuring out how to make the machines work, and the girls enjoyed all playing together. In fact, they woke up the morning after we first played and immediately asked to play again. I have some concerns about the “video game culture”, and we limit the time our girls spend using electronics, but quality educational games that get them thinking and learning are the ones I want them to play when they do play! One lucky Life Your Way reader will win a thinkSMART Games prize package that includes all of the games listed above! Leave a comment. Which thinkSMART game do you think your kids would most enjoy? 3. Follow thinkSMART Games on Facebook.